The Justice League of America has stopped wars, defeated galactic invasions, grappled with gods and faced the breakdown of objective reality itself. The league’s most important function, however, is to offer free group therapy sessions to its grieving, dysfunctional members. At least that’s what Superman claims in this insipid 2005 trade. The six issues collected in Pain of the Gods each focus on a different member of the team, showing the way that they grieve over failures, struggle to fit in, or cope with their pasts. These vignettes range from the obvious (Batman is hung up on his parents’ murder? Who knew!) to the ludicrous (apparently Wonder Woman is terrified of her own death.) Worse, rather than showing the heroes coping with their various neuroses in the field, the bulk of each story is given over to scenes set in the Watchtower as the various team members talk to each other, looking to the group for comfort and self-help platitudes. Lest you think I’m exaggerating — it is actually said that the Watchtower should be seen as a “safe place” where its ok to share your feelings. Now, won’t get me wrong — I’m not one to claim that for superhero stories to work the characters have to possess an unflappable optimism or unshakable self-confidence. Indeed, if these stories had been written in 1962, I’d probably be praising their sophistication. But the modern age of comics can be defined in part by the attention paid to the inner lives of costumed heroes. In the past 25 years a tremendous number of stories have explored the conscience and emotions of these icons with wit, nuance, and insight — three traits these stories simply lack. The worst sin here, however, is against the Martian Manhunter. J’onn J’onzz has been a member of every incarnation of the Justice League and has been described as the “heart” of the team. 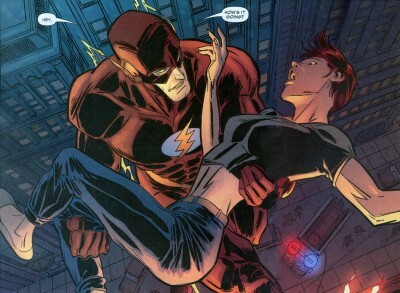 Prior to the League’s creation he spent years living among humans, working as a private investigator. Despite his alien appearance, he has always been shown as a warm individual capable of level-headed leadership and quick to empathize with others. All of which leaves one wondering what happened to that character in this story, where we’re presented with a cold and distant loner, utterly incapable of successfully pretending to be human. And what’s the point of this complete reinvention of his character? A strained and facile metaphor for fear of commitment. Really. Thankfully, Ron Garney’s art for this book is in an entirely different league than Chuck Austen’s writing. His drawings have a sketch-like quality that, rather than seeming amateurish, creates a sense of urgency in the more action-packed scenes and adds rawness to the otherwise interminable emotional discussions. Particularly striking is a tenement fire in the Flash’s story, a scene that positively crackles with life and momentum, thanks entirely to Garney’s art. Although Garney is not the best artist to have worked on JLA, nor is the art so good as to make one overlook the writing, he shows himself more than capable of working with the world’s greatest superheroes. It’s a shame that he has not done more work for DC than a handful of JLA issues and three-issue stint on Green Arrow. Colorist David Baron chose a somewhat muted color palate for the book, which gives the images a vaguely autumnal feel. While appropriate for the story’s moody tone, the color sometimes seems to be working at cross-purposes to Garney’s drawings. Although entirely adequate, I can’t help but think that a bolder palate could have improved the work somewhat. Not really. While this story doesn’t contradict any ongoing continuity, it does not seem to have been written with any particular era in mind, nor does it directly reference any past or on-going story arcs. If you’ve had no exposure to the modern JLA, you ought to pick up New World Order, the first collected edition of this series and the beginning of Grant Morrison’s fantastic run. If, on the other hand, you’ve been reading the JLA trades in order, make sure you read Justice League Elite, Vol. 1 before this volume, as that book explains the absence of the recent additions to the team. If this was your first exposure to the team and you’re interested in reading more/better stories, highlights include the aforementioned New World Order, the Batman-centric Tower of Babel or the terrific JSA team-up Virtue and Vice. 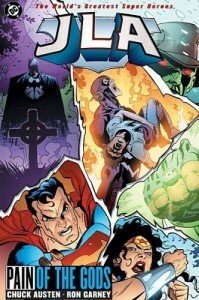 Alternatively, if the themes of guilt and uncertainty among the JLA interest you and you’d like to see them handled with more subtlety and in the service of better stories, you might consider the heart-breaking DC mini-series Identity Crisis or the excellent Martian Manhunter story, JLA: Trial by Fire. Great review, Daniel! Thanks again for joining the team. I’m really looking forward to you future contributions. Nice review, Daniel! I didn’t know that Garney had done any work for DC, but as I was reading Captain America: To Serve and Protect the other day (which Garney did with Mark Waid), I actually thought to myself that he would be a great Flash artist. If you’re curious, you don’t have to look much further than the book’s first two-page spread to see what I mean. Also, it didn’t surprise me at all when I got to the part where you mentioned Chuck Austen wrote this. When it comes to simplistic takes on well-established characters that contradict everything those characters stand for, Austen is the undisputed master. It’s nice to be the master of something? By the way, Marc, how is the site working for you? I’ve been chatting with Daniel a lot about this, but there’s been some significant changes in the hopes of speeding everything up and making it a little more stable – hopefully you’ve noticed? In this case, I’d say it’s decidedly NOT nice to be the master. Oh, Chuck Austen…one of the few names in comics that can really make my blood boil, haha. The site seems to be working a lot better now. I think taking out the background image helped, because it’s loading a great deal faster for me than it was. haha, yeah there was that (the thing was almost a meg! how did I miss that?) and about a billion other things – primarily some really selective and specific (and widespread!) caching. Then a lot of compressing and optimization, and some bug fixing. browse your site on my iphone during lunch break. I really like the knowledge you present here and can’t wait to take a look when I get home.